Easter is a wonderful and refreshing time of year full of love, fresh air, spring cleaning, family get-togethers, worship and celebration. It also happens to be the time of year many of us feel our craftiness is finally refreshed and rejuvenated after the busy winter Holidays. What do you get when you combine the fun of an Easter gift basket with the beauty of a flower arrangement? 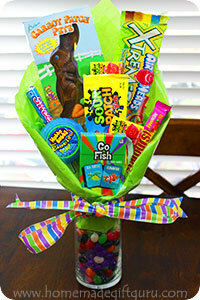 Homemade candy bouquets make delicious and adorable homemade Easter gifts. This featured Easter candy bouquet is bright and beautiful. 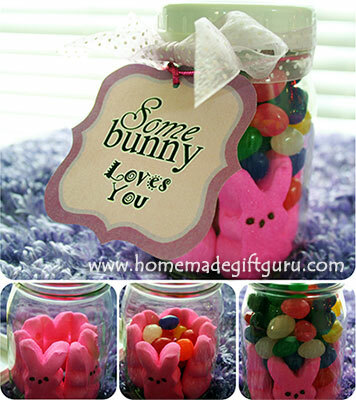 It's also a great example for how to use a candy-filled glass vase and also how to include a keepsake gift (in this case a card game of Go Fish). 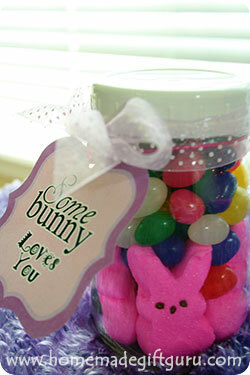 ...as well as these adorable potted candy arrangements, which would also make a perfect Easter gift idea. 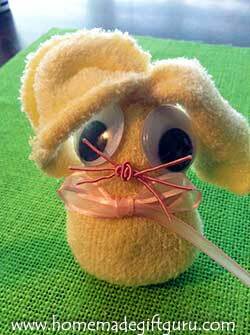 Original No-Sew Sock Bunny: This bunny can hold an Easter Treat, Flowers or an Easter Balloon. It's also a very cute addition to your homemade Easter gift basket. 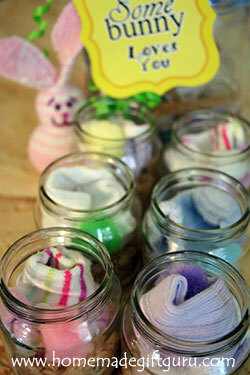 Sock Rabbit Baby Bunnies: Use Up Those Cute Little Mismatched Baby Socks by making sock bunnies from baby socks! Baby sock bunnies can be hidden in large Easter eggs for a super fun surprise during this years Easter egg hunts or inside Easter baskets. 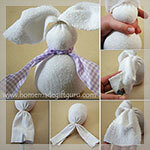 Sock Crafts Bunny Kit: Make a DIY Sock Bunny Kit for Somebunny special! Anyone young or old can have a blast making cute little sock bunnies using the beautifully packaged supplies and instructions you provide. Free printable labels and instructions make this a fast and easy homemade Easter gift idea. For a super easy homemade Easter gift idea, you can make little jars filled with Easter candy and decorate them with festive ribbon and homemade gift tags! Easter basket cupcakes are fun and tasty. Make cupcakes with your favorite cupcake recipe. Frost. Add green colored shredded coconut or your own version of "edible shred." Place polka dot jelly beans in the center. Make basket handle out of licorice, twizzler or similar candy. Make sugar cookies using your favorite sugar cookie recipe. Roll dough (per recipe instructions) and use festive cookie cutters such as; bunny, bunny paw print, flower, butterfly, dragonfly, duck and Easter egg cutters for example, to make Easter cookie shapes. Bake and then decorate with frosting, sprinkles, edible glitter and even edible pens. To give Easter treats! Purchase a clear glass platter. On the bottom (so it shows through on the top) lightly glue Easter paper or image and allow to dry. Carefully coat the bottom with varnish and allow to dry. Repeat until well protected. Seal with a water proof sealer. The platter can be used to give Easter cookies or other delights and should be hand washed as needed. This fun and easy project is great for kids or adults. Purchase polymer clay and warm the clay by kneading until soft. Then roll it out to 1/4 inch and cut out Easter egg shapes. Use other colors to make polka dots, stripes and zig zags for decorations. Bake per instructions and using a hot glue gun, glue magnets (available at any craft store or even Walmart) to the backs. You can also do this with white polymer clay, bake the egg shapes and then paint with acrylic paints, write names and even apply glitter. Spray on acrylic sealer if desired for a long lasting finish. 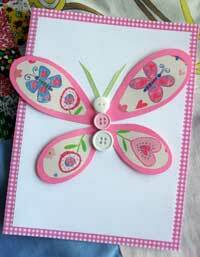 Other easy shapes to make: butterflies, dragonflies and flowers will make cute magnets to go with the Easter eggs. Give these to friends, for teacher gifts or inside the large plastic Easter eggs. Basket of Bulbs or Flowers. Cover the inside of a basket with thick plastic, folding edges over about an inch below the rim of basket. Fill partway with potting soil. Plant bulbs and/or other spring flowers being careful not to overfill the plastic lined area. Cover the top lightly in a mossy mulch to cover any plastic still showing. Tip: Mix bulbs and a blooming flower such as pansies for something to enjoy right away and for weeks or plant bulbs a couple weeks early so they have grown and at least formed buds by the time you give them. A floral wreath makes a wonderful hostess gift if you are going to an Easter brunch for example. Pick out silk flowers and Easter ribbons. Adorn with ribbon and other embellishments such as tags, butterflies, dragonflies or even glitter eggs (see below). Beautiful Eggs for Wreaths and other Arrangements. Wreaths and fresh or faux flower arrangements make sweet Easter gift ideas and very nice Hostess gifts for someone who is hosting an Easter meal. Create delicate eggs to adorn a wreath or arrangement by poking a small hole in the top and a slightly larger hole in the bottom of an egg, piercing the yolk and then blowing carefully from the top so the insides pour out. Rinse inside of egg shell well and allow to air dry. Cover in glue and then glitter. Dry and spray with acrylic sealer if desired. Carefully hot glue the eggs to the wreath (you can also carefully secure each blown egg on a skewer and use them in a faux flower arrangement). Pick out a white coffee mug or an Easter themed coffee mug. Place green floral foam snugly inside the mug. Make a floral arrangement and glue some wrapped Easter candies to wooden skewers or other sticks and mix them in with the silk flowers. 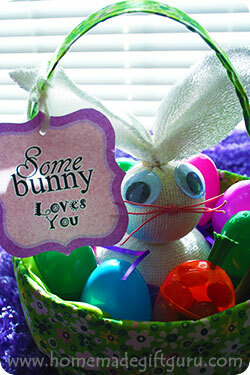 Make a cute Easter themed gift tag and tie on with Easter ribbon. Lavender Bottles. Turn your fresh blossoming lavender stems to make sweetly scented woven lavender wands. Rose Water. Learn how to make rose water this summer using your fresh garden roses.